Armstrong Steel specializes in Steel Building Systems, and we want to make sure every builder has access to information that will support them through the entire building process, from the time an individual begins their search, to the building purchase and beyond. Armstrong Steel has helped millions of people learn about the benefits of a steel building. Knowledge is a cornerstone of the building buying process, which is why Armstrong Steel made this unique Virtual Steel Building. This is not your average building diagram, but is specific to Armstrong's Building System. This serves as an excellent tool to have up on your screen whenever you're speaking about the intricacies of your project. Armstrong Steel's maps provide you with a bird's eye view of Authorized Armstrong Builders and Armstrong Steel Building Systems in an easy to use map that is optimized to be used on mobile devices as well as your laptop. For those currently exploring the possibilities of steel, we have an extensive amount of brochures designed to further inform you or your customer on Armstrong's Steel Building Systems. Armstrong Steel Building Systems has helped millions of people learn about the ins and outs of steel buildings, which means we've seen many questions over the years. For your convenience, we have compiled the most common questions and answers into short videos to help you better understand the steel building process. Similar to our Video FAQs is our written FAQs. If you prefer to read the frequently asked questions, this page has all of them compiled into a single steel building resource. If your question isn't listed, feel free to call us at 800-345-4610. When buying a steel building system, many terms surface that you may not fully understand. 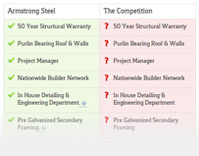 This page covers hundreds of terms that deal directly with your steel building. Our erection manual is a step-by-step guide for on site building erection. Armstrong's Global Network includes a collection of blogs that cater to the needs and interest of contractors, builders, do it yourselfers and their families. Each of our blogs feature a Facebook page and Twitter Feed to help you connect with us as well as the other builders and do it yourselfers involved in the community. Future First Time Builders, with design and finance tips preparing first-time builders. Contractor Central: Builders & Creators, an outlet for the many general contractors all over the globe. Small Business Owners Network, an outlet geared directly for small business owners growing their businesses. Pastors & Church Leaders: Places of Worship, is a friendly community to respectfully discuss your faith with others as well as learn from other congregations' building experiences. Steel Building Insider: Offers tips, advice, and training for those who have purchased or are about to purchase a steel building from the unique perspective of someone who works in the steel building industry.